The 2 up and 2 down set-up is designed for the serious player. The unique Maple and Walnut shell composition coupled with the SONIClear bearing edge results in a clear and focused rack tom, a fat and dense floor tom, and a bass drum with a balance of punch and boom. 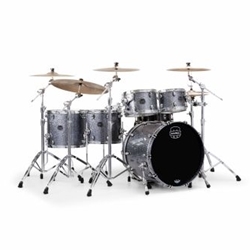 With its 10",12”,14" and 16” tom sizes, this set-up is a great kit for most any application. -The 2 up and 2 down set-up allows players to configure the kit for almost any application. The commonly preferred 10X7" ,12x8”, 14X12",16x14”, and 22x18” sizes allow the player to configure the kit for a wide range set-ups. -The Maple and Walnut hybrid shell produces a strong attack and a rich tone that projects well in live settings and tracks perfectly in the studio. It’s the classic Saturn sound. -The SONIClear bearing edge simplifies the tuning process and enhances tone and tuning range.